REHEARSING MEMORY, (2007), A single screen video work divided into several acts and scenes each dealing with different aspects and types of memory. 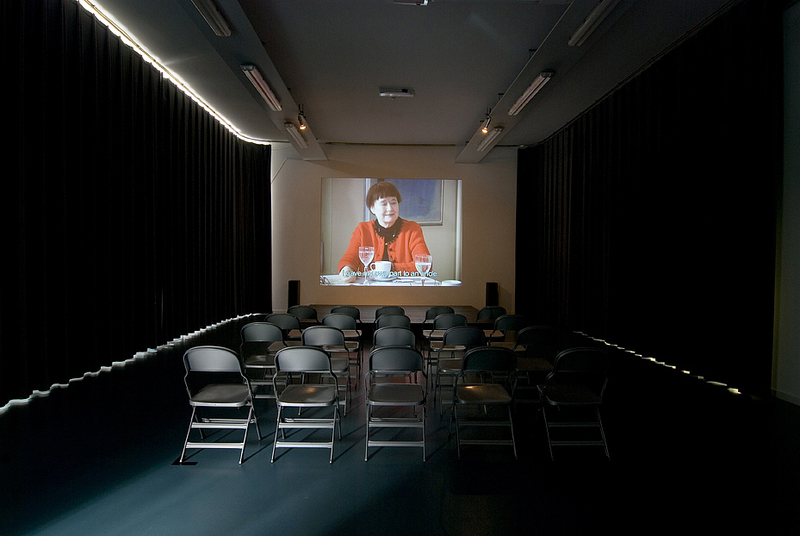 The 22:23mins.long video piece was recorded during a one-day long filming session, which took place in March 2007 at Willa Mac, Museum of Contemporary Finnish Art in Tampere, Finland. Rehearsing Memory brings together three sisters, now all in their seventies and living in various parts of Finland for a reading of some ‘official’ and personal documents and letters describing the events surrounding the death of their father during ‘The Second World War’, as well as to share personal and collective recollections from this specific, historically important time period in their childhood. Wanting to produce a situation that would allow for the subjects in it to oscillate between the re-activation of narrative and involuntary memory and the fixing of these fluid moments of recall and involuntary memories into personal narratives, I became to choose this situation for several reasons. One reason was that this event had turned out to become a significant one in the family’s historiography, affecting the following generations including my own personal history. The other was the fact that as these women had not been together in 22 years, they would inevitably be reconnecting, after such a lengthy pause, through acts of personal and collective recollections and so memory would obviously be the means through which their becoming to each other would take place as they would perform themselves to each other once again. I felt that this set up would place me in a position in which I would be exposed to the relational processes between memory, identity and the production of ones own subject-hood. But it was also a situation through which I could allow for new knowledge to be produced by the gaps, the silences, the body language and the very configuration or constellation of the ideas, feelings and characteristics that these women embody. Throughout the whole process, all of the women seemed to oscillate between personal recollection and the larger cultural meaning/s of their personal childhood events. They took turns in being inside a memory and then looking at it from the outside locating it in a larger context of meaning outside of themselves. This tension between the personal, collective, cultural and historical memory and their constant negotiation by all the participants present was given a highly important role and as a result various types of memory became produced, moving from personal- to cultural- to historic memory. Questioning the authority of memory given in the construction of historiographical narratives and historical singularities, that such narratives produce, Rehearsing Memory places the production of memory in the present moment where it becomes actualized and mediated again and again in its relation to the conditions of the present moment as opposed to the past. This entry was posted on	April 8, 2008 at 10:16 am	and is filed under Recent Works.